Join us as Manipal University, Dubai celebrates Earth Hour tomorrow! “I will, if you will” is the slogan for this year’s official Earth hour celebrations on 31st March around the world, in which millions of people from different countries unite with an aim to conserve energy and adapt a sustainable lifestyle. Each and every individual is responsible for their impact on the environment, collective actions is the solution to the drastic changes in the world’s environment. The world’s biggest cities take part in this annual campaign to symbolize their support for the environment. Famous landmarks around the world, just to name a few like; the Sydney Opera House, Eiffel Tower, Buckingham Palace, Pyramids in Egypt, Niagara Falls, and not to forget Burj Khalifa, whose lights are switched off to raise environmental consciousness among everyone. If you wish to observe earth hour as joint, visit the man-made landmarks in UAE to celebrate power-saving and for the pursuit of living in a better healthier world. Emaar Properties group is hosting the Earth Hour Walk at Burj Plaza, Downtown Dubai; to raise awareness about climate change and promoting the green vision of UAE with a candle light march at 8:30 P.M. The Municipality of Abu Dhabi City in co-ordination with Abu Dhabi Music Arts and Foundation for an event at the Corniche which will start at 6 P.M. that includes recycling stations and fun activities for attendees to show their support. The Sharjah Electricity and Water Authority (SEWA) started off an intensive campaign to educate residents about participating in the Earth Hour. To mark this initiative; lights of Al Qasba will be switched off and people are encouraged to visit the site for a common cause. Museums, heritage sites, government departments across Sharjah will also support the earth hour. 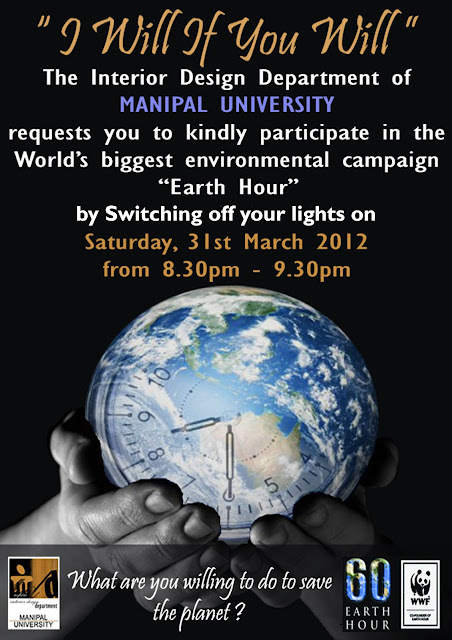 Not known to many, but even Fujairah has a beautiful event lined up for Earth Hour. In front of the Fujairah Municipality, candles and floating lanterns will light the night sky to mark this global phenomenon. Major malls across the Emirates will also be conducting a range of activities for children and adults, to expand the knowledge about a living a sustainable lifestyle. And if you don’t wish to celebrate the earth hour in herds, then you must CHECK out these tips on how to spend tomorrow's earth hour effectively on your own.